Easter (and hopefully reprieve from cold weather) is almost upon us. To help you make use of the extra days off we have a few Easter destinations you must visit at least once in your lifetime. If gorging yourself on chocolates is more your speed, we've put together a chocaholics dream list of (almost) guilt-free getaways. To round out the experience find out about some of the exotic Easter customs from around the world. Easter means different things to different people, so this month we've decided to look at a range of our favourite easter destinations for 2012 and to explore some alternative holiday ideas. From a trip to the Holy Land in Israel, to a four day blues and roots festival in Australia, this really is a mixed basket of goodies - but there will be something for everyone. April high-season in Israel: the weather is at its prime; the intense summer heat hasn't kicked in, but the days are still long, bright and beautiful (not that winter is what anyone would normally consider 'cold'). Tel Aviv is the first port of call and people are always blown away by the classy infusion of trendy hotels, restaurants, art galleries and resorts. That's not to mention the impressive architecture and cracking nightlife - all in a country that is famous for its ancient relics. In a nutshell, Tel Aviv is the Miami of Israel, with less pretentious people and cleaner sea water. Jerusalem will always be the country's biggest hit when it comes to tourism though. The streets of the Old City are jam-packed with folks who are there to witness the proud buildings and the sacred Western Wall, still standing after thousands of years. There are a host of tour operators that offer packaged deals, which also cover essential day trips to the Sea Of Galilee, the Dead Sea, plus shorter journeys to the Garden of Gethsemane and Calvary. 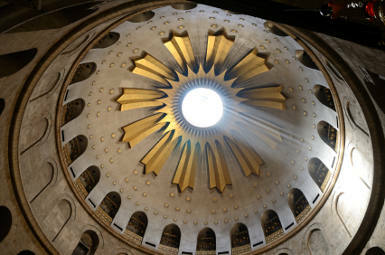 Easter, Winter, any time: Jerusalem is a special place that is well worth the visit. Downtown Manhattan's 5th avenue becomes a sea of bonnets every Easter, during a parade that has been taking place since the 1870's. Thousands of people, young and old, come out in their fanciest attire and strut their stuff from from 49th to 57th street - despite the normally chilly mornings that still keep people clinging to their blankets. 2012 is a big year for tourism in the USA, and New York never fails to disappoint. The city itself dons a bonnet, as the flowers and trees get their groove back through the Spring sunshine. If you had doubts as to how hard the Pope's job gets, you should see Rome during Easter Weekend; the man blesses, prays and addresses crowds for 96 hours straight. The city of Rome is flooded with people who are there to witness the 'Triduum' processions, which start on Easter Thursday and go on all weekend. St. Peter's Square and the Basilica are where a majority of the action takes place, with Easter Mass being open to the general public and very well attended by all. Churches throughout the city will be hosting celebrations though, so you will be spoiled for choice. One of the other perks is being able to do some sightseeing on Sunday and Monday, when everything is closed and all the monuments and buildings are less hectic - let's face it, Rome will never be empty. Byron Bay's legendary Blues Festival is an international 'Must See', boasting the sort of line-up that brings music lovers of all ages, creeds and preferences together at one, beautiful venue. Now in its 23rd year and permanently settled at the gorgeous Tyagarah Tea Tree farm, 2012 Bues Fest will be graced by Crosby, Stills and Nash, Creedence Clearwater Revival's John Fogerty, My Morning Jacket, Angelique Kidjo, John Butler Trio, Keb Mo and a huge selection of other greats. As far as an Easter celebration goes, Blues Fest is the sort of weekend experience that will blow your mind, change your life and create stories that you will be telling all your friends twenty years from now. Chileâs Easter Island is something of an anomaly. Happening across it on Easter Sunday 1722, a Dutch Explorer was greeted by 887 giant statues. Dated back to the 1200âs, the statues (or moai) are second only to Stonehenge or the Pyraminds - a constant source of bewilderment for the many who have attempted to understand their existence. A few theories that have been expounded include an initiative of aliens (to reveal their artistic flair?) or that they were built by islanders to house the spirits of their ancestors and were transported either by elephants or pure mind-power. Considering that the largest Moai weigh about 84 tons (thatâs almost 17 adult elephants), we remain unconvinced, but nevertheless wouldnât miss an opportunity to experience one of the worldâs greatest archaeological sites. For those adventurers who hanker for action, the island has three volcanoes, which are great for hiking, crystal clear waters that make for perfect scuba diving, and incredible surfing - a superb combination of age-old mysticism and nature at its finest. Easter Island might be the most remote, inhabited island on earth, but weâd travel the world to get there. The Easter Bunnyâs annual visit is one of the most highly anticipated days on the calendar. Just the word 'Easter' has a Pavlovian affect on little ones, who spend most of the last few weeks of March asking their parents the same thing every day: "When's he coming again?" The funny thing is how that anticipation still lingers in adults, long after we've gotten the bad news about everyone's favourite bunny not being real. Chocolate remains everyone's favourite legal drug of choice and this month in commemoration of our childhood memories, we're looking at the best chocolate tours in the UK. 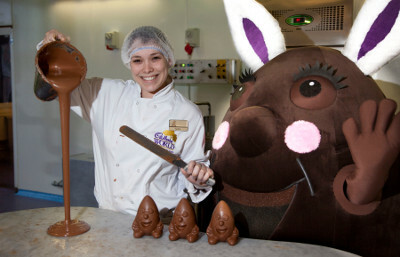 Cadbury World, âWhere Chocolate Comes To Lifeâ, is hosting a fortnight of family fun this Easter, starting on 31 March and going on until 15 April. Itâs a sensory extravaganza from the start. As you walk through the front door the smell of sweet, warm chocolate hits you like a stiff breeze. All fourteen zones that make up Cadbury World will be going full steam ahead, giving everyone a tour of the UKâs most iconic chocolate factory. The demonstration zone is an opportunity to see the Cadburyâs chocolatiers at work, and also gives kids a chance to try writing their names in liquid chocolate. Prepare to be very impressed. Not that reviews will tell you everything there is to know about a tour operator, but a quick search for Chocolate Ecstasy Tours will definitely give you a peek at the sort of reactions Jennifer Earle generates with her chocolate tours of London. Jennifer and her team of chocolate boffins will bowl you over, by taking you to the finest distributors of chocolate in the city, keeping you entertained and educated all the way through â not to mention blissfully happy with the sampling. From the history of chocolate in the UK to the latest varieties and trends, Chocolate Ecstasy Tours will take your through the highs and lows of chocolate in society today. For more info visit www.chocolateecstasytours.com and watch Jennifer Earle answer questions about chocolate below. The Chocolate Factory offer a tour of their premises that puts you in the picture: you'll learn exactly how its made, where it comes from and all the steps that cocoa beans go through before they becomes the delicious chocolates you'll be grabbing for at the end. The organisers do an incredible job of threading the big picture of chocolate making into a fun tour that kids will love and parents will find interesting. All tours are available by booking only, so be sure to check out their website for information about times and contact details. We've heard rumours of Ooompa Loompa's, but you'll have to visit to see if it's true. If Easter has become just a few extra days off for you, maybe it's time to spice it up by trying out these weird and wonderful customs from around the world. Better yet, make sure you visit these places during Easter to experience strange but refreshingly new customs. The common Easter egg is the ersatz version of the FabergÃ© egg - a work of art much prized amongst collectors. The original authentic FabergÃ© eggs were made by the House of FabergÃ© between 1885 and 1917; what makes them so highly sought after is the fact that there are only 50 known to have been made, with about 42 still in circulation (and by that we mean safely locked away in a museum or a multimillion pound private collection). 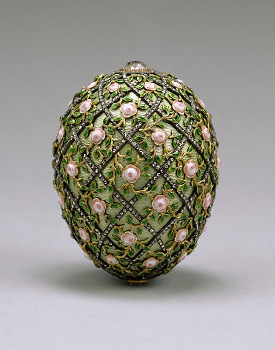 The eggs were commisioned by the last two tsars for their wives and made by the jeweller Peter Carl FabergÃ©. The egg to the right is the Rose Trelis Egg, No. 33, made in 1907 to commemorate the birth of Alexei Nicholaievich and came with a portrait of the young tsarevich (son of a tsar). It's made with gold, green and pink enamel, diamonds and satin lining. At the time of its making, it cost the princely sum of 8500 roubles; today it would cost a small fortune to buy, so rather get that special someone in your life a chocolate easter egg and thank your luck stars you're not married to a tsarina. The laidback people of Bermuda have a typically island-style take on Easter, with the leisurely activity of kite flying raised to a custom on Good Friday. Visit any of the island beaches during Easter and you'll be competing with kites for some sunshine. Easter kites are usually hexagonal in shape and range in size from the small to the really large (really bothersome when you're trying to get a tan). Some stay up all day. Legend has it that kites were first flown on Good Friday to represent the ascent of Christ. A fun way to pass the Easter weekend is to build your own kite with your kids. Visit Activity TV and watch their video below to build yourself a kite for Easter. Semana Santa is celebrated during the last week of Lent in Spain and throughout Latin America. 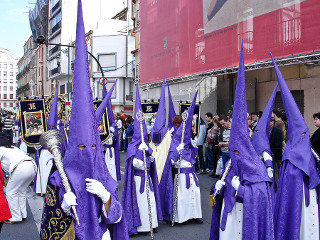 The festival is most well known for the hooded garbs - known as capirote (see right) - that are worn by certain brotherhoods during processions (this has religious roots and is unrelated to the similar garb worn by the Ku Klux Klan in the US). For women, the headgear of choice is a mantilla made of black lace and used to cover the hair. The most visited procession in Spain is the Sevilla, where processions are organised by age-old religious brotherhoods (called hermandades and cofradÃ­as) with stricly observed customs and order. Each day of the Holy Week brings new garbs and new customs for visitors to observe. As a spectator, you are expected to clap when an image (either of Christ or of the Virgin Mary) is raised and once the image has passed, respectful silence is expected of observers - the experience is at once otherwordly and spellbinding - you'll soon find yourself attending every procession you can. It's best to plan a visit to Seville well in advance as the city is overbooked during the Holy Week or if you're short on time, find a smaller town to experience this uniquely Spanish Easter experience. Easter time in the Czech Republic sees pussywillow bushes stripped of their twigs for a quaint pagan custom that involves making braided whips - not for corporal punishment, but for 'whipping' loved ones into health. Czech boys make colourful braided whips to playfully (and lightly) whip girls to give them health and youth - hence the name PomlÃ¡zka meaning to 'make younger.' These days you're more likely to find a PomlÃ¡zka being sold at a streetside shop and girls whipping boys in turn. Prefer Cheese to Chocolate? Check out our top cheesy holidays and maybe have some wine with that. With all the extra days off, the kids will need entertaining. Pick any of ourTop 10 Alternative Family Holiday Ideas for a day of family fun. For the spiritual traveller why not take a jaunt across the Chanel to see the Top 10 Religious Sites in Brittany.